Rotini pasta. Tender shrimp. Cool cucumbers. This noodle salad is full of texture and flavor. Best of all, it's a snap to make! Cook pasta as directed on package. Meanwhile, mix dressing and soy sauce in large skillet on medium-high heat. Add shrimp; cook 8 to 10 min. or until shrimp turn pink. Drain pasta; rinse, then drain again. Place in large bowl. 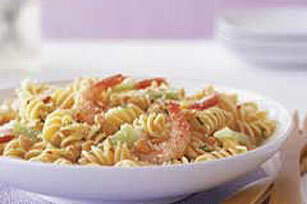 Add shrimp and all remaining ingredients except cheese; mix lightly. Don't salt the cooking water until after it has come to a boil. Salted water has a higher boiling point and takes longer to heat.